Earlier this year, eVolo Magazine announced the winners of their 2015 Skyscraper Competition. The award was established in 2006 to recognize innovative architects and designers that are changing the way we think about vertical living and architecture more generally. 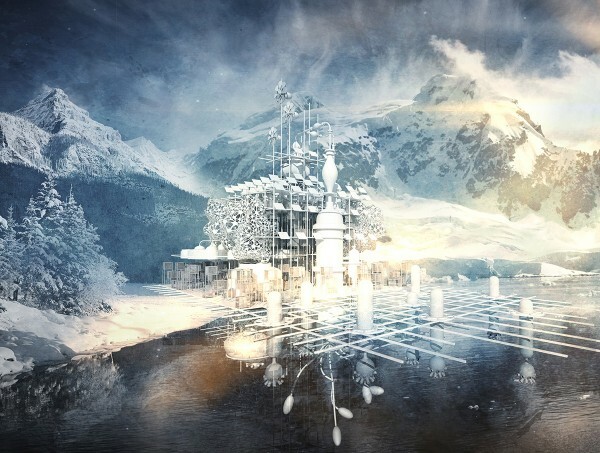 Their ideas not only challenge the way we “understand vertical architecture and its relationship with the natural and built environments,” but also give us insight into the future of architecture as envisioned by the people at the forefront of their fields. This year, the jury was responsible for choosing three winners and 15 honourable mentions based on ingenuity and creativity. Many of the honourable mentions focused on sustainable development or re-imagined architecture as complementary to our natural environment. Below we’ve compiled a list of some of the most interesting honourable mentions that propose sustainable solutions for our future skyscrapers. Described as a new-age “Noah’s Ark,” Qidan Chen’s Tower of Refuge submission envisions skyscrapers of the future as something more organic and integrated into the environment than the glass structures that characterize many cityscapes today. Chen shifts the focus from survival to sustainability. 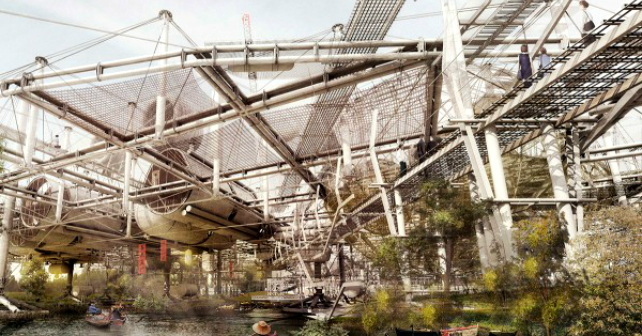 Today, many architects and designers are focused on constructing “survival fortresses” or exploring the idea of living in foreign habitats in outer space. However, Chen’s submission returns our gaze back to planet Earth, and uses development to promote environmental sustainability and a deeper understanding of our own planet’s delicate architecture. Chen believes that before we start reproducing our liveable climate on other planets, we have to build a “Noah’s Ark” here on Earth. His skyscraper is integrated into our landscape, and can produce sunlight, air, water, and enough soil to support plant growth, serving all survival conditions. This refuge would function like a “self-operating machine,” filtering water and air, reallocating sunlight, and harnessing solar energy to fuel the tower. 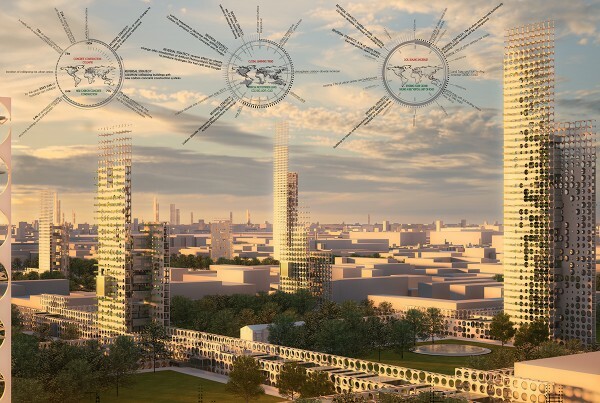 Chen’s vision is important as his tower abandons many of the characteristics we have come to expect from skyscrapers, and draws inspiration from our environment in order to create a truly sustainable structure. Luigi Bertazzoni and Paolo Giacomo Vasino of Italy are looking to create structures that facilitate more public spaces and utilize sustainable materials. 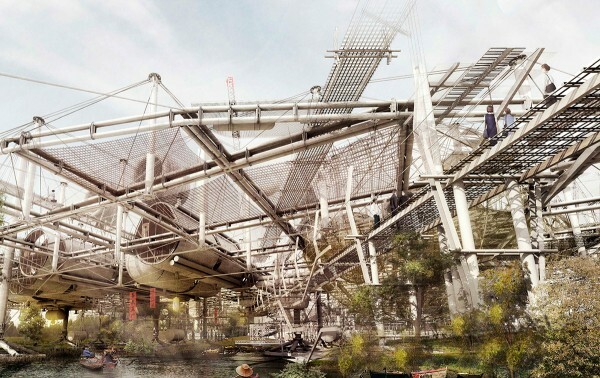 Their submission focuses on reversing the collapse of our primarily concrete urban spaces and developing new materials such as a carbon composite. In the 20 years following World War II, almost 60% of the world’s concrete buildings were constructed. Due to the decomposing process of carbon, reinforced concrete structures become unstable within 70-80 years. This means that over the next few decades many countries will have to invest a significant amount of time, resources, and money into expansive structural refurbishments and renovations. Bertazzoni and Vasino want to create more durable construction materials to avoid expensive reconstruction and the danger of our cities collapsing. Their new urban spaces would not only be constructed from sustainable materials, but would also increase the amount of available public space, an essential component in our vertical spaces. 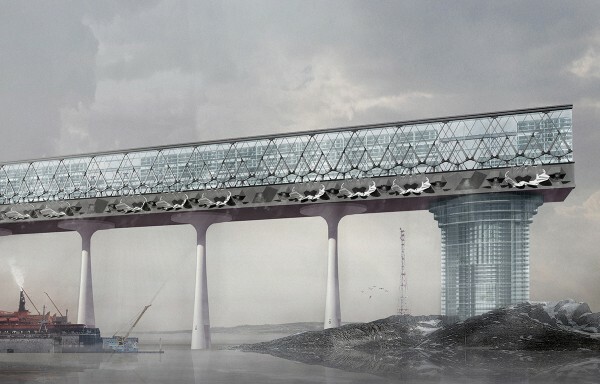 The Re-Generator Skyscraper is part of Gabriel Munoz Moreno’s plan to regenerate the wetlands of Hangzhou. Moreno is looking for alternatives to today’s building methods so that the industry can develop construction tools and guides that make urban growth compatible with the preservation of our environment. The goal is to use architecture to change the way we think about urban development and interact with our cityscapes. Like the Tower of Refuge, this tower will be a living part of the landscape, and is based off of the structure and behaviour of natural cells. The building, like the wetlands, will be susceptible to constant change, growth, and regeneration. In this harsh environment, the main priority of the project would be to redefine the energy supply of the city (and region more generally) by switching from fossil fuels to more environmentally sustainable energy sources such as wind and tidal power. According to the architects, the wind and tidal power plants could reach up to 500 MW, which is enough energy to power a city double the size of St. Petersburg. The project would also incorporate sustainable water recycling infrastructure. These irrigation systems would harvest rainwater and utilize desalination plants to provide the residents with a supply of fresh water. According to the architects, 29% of the Earth’s surface is land, and approximately 33% of the land’s surface area is desert! The Bio-Pyramid is a non-conventional skyscraper that functions as a “bio-sphere” or greenhouse, regenerating the drylands on the edge of the Sahara Desert on a “nomadic scale.” Inside, the greenhouse would support a series of plant species including barrel cacti and berry bushes. These plants are selected specifically because water can easily be extracted from them using condenser trap theory. Egypt is currently facing a growing pollution problem which has had a negative effect on their limited water supply. The bio-dome would not only reintroduce vegetation to the area, but also produce fresh water and harness greenhouse gases to produce energy-efficient materials. This structure is part ancient pyramid, part modern skyscraper, part biosphere, and part historical preservation project. 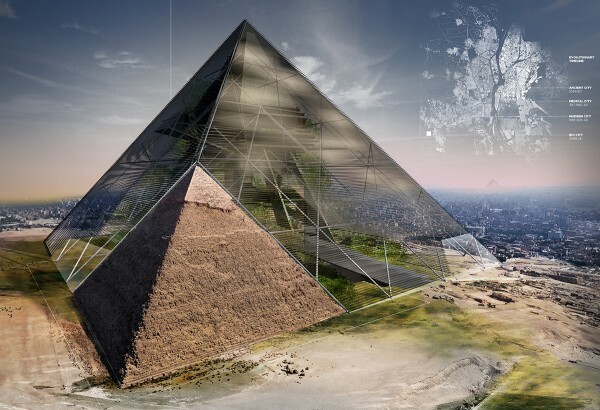 Not only would it preserve a piece of the historical pyramid, but also create fertile land, boost tourism, and create new economic opportunities for the country. Though these buildings may never come to fruition in our lifetime, they do represent the future of architecture and what is possible in the eyes of today’s designers and architects. Their designs and proposals strive to integrate themselves into the natural environment, creating a sustainable structure that doesn’t conquer the environment, but complements it. Will the builders and developers in the GTA work with architects and designers to create buildings like this in the near future? What do you think the future of sustainability will look like in Toronto?